Integrity has become the fundamental condition for governments to provide a trustworthy and effective framework for the economic and social life of their citizens. The institutions and mechanisms for promoting integrity are more and more considered as basic components of good governance. Cultivating integrity in public authorities not only fosters effective, ethical governance and public trust; the incorporation of integrity as a core value (inculcated through training, awareness-building programs and management support) provides a framework for sound decision making and ethical conduct. In so doing, mechanisms that promote integrity help leaders and employees of public authorities to navigate the sometimes complex relations between public duty and personal interest and other factors that can give rise to misconduct and unethical behaviours, whether deliberate or inadvertent, that, in turn, erode public trust and negatively affect workplace harmony, job satisfaction, productivity and service. 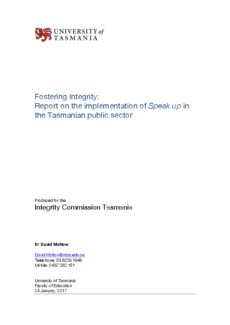 A key finding of the OECD report was that ‘Putting values into effect needs communication of core values as well as training to raise awareness within the public service.’ To this end, Speak up is a campaign developed by the Integrity Commission in Tasmania to raise awareness of ethical issues and empower employees of public authorities to foster integrity, and to identify, reduce and prevent misconduct by ‘speaking up’ when they experience or observe such behaviour. Speak up is a ten-year plan for cultural change that has been rolling out to Tasmanian State Service agencies, councils, Government Business Enterprises, state-owned companies and state authorities (hereafter referred to as ‘public authorities’) since September 2014. As an increasing number of public authorities adopt the campaign, ‘speaking up’ is intended to become embedded into workplace culture as a continuing part of working life in the public sector. determine the extent to which the Speak up campaign has alerted employees of their rights and responsibilities in this regard. This report highlights findings associated with these evaluative aims, organised according to four key research questions.